Four systems are covered under the ‘Strategic Partnership’ model - submarines, single-engine fighter aircraft, helicopters and armoured carriers/main battle tanks. Logically, Artillery Guns, which are a major firepower component of any Armed Force should have been part of this model. However, they are not. Why? The reason is that the Indian Artillery is undergoing dramatic changes. With the impending induction of four guns - the M777 155mm ULH, K9 Vajra Self-Propelled 155mm Tracked Howitzer, 45 Calibre Dhanush 155 mm Gun and Upgunned 45 Calibre 155mm Dhanush, Indian Artillery has gone beyond ‘Strategic Partnerships’. Add the qualitative and quantitative upgradation in Rockets and Missiles, improved ammunition availability and enhancement in battlefield surveillance capabilities. Indian Artillery is far ahead of the curve. The physical manifestation will be visible when the M777 ULH and Vajra are formally handed over to the Army shortly. In about five to seven years, the Indian Army will have one of the toughest and strongest Artilleries in the world. , therefore, a reason to reflect as to how this has happened. A major factor for the successful Artillery modernization was having a long-term vision document and the determination to go through with it. At the turn of the century, 155mm was adopted to be the standard caliber of all Guns. 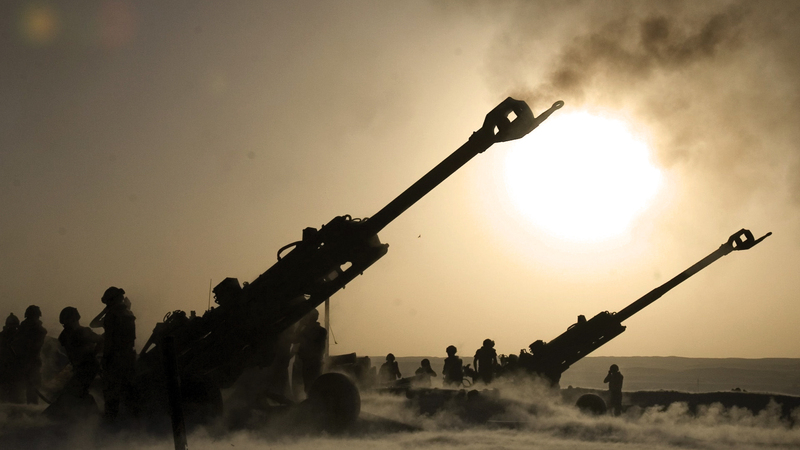 Despite many contrary views and hurdles in implementation, Regiment of Artillery never deviated. The success of the 155mm Bofors Guns in breaking the Pakistani backbone during the Kargil conflict reinforced this decision. The plan was codified initially as the Arty Profile 2017. It was later refined and promulgated by the Indian Army as Arty Profile 2027. The MOD, DRDO and OFB were also communicated about this profile. Hence, there was a commonality of thought threading the decision and execution spectrum. Resultantly, there was no room for kite flying and fly by night operators to manipulate their way. Director Generals of Artillery, since 1998, were involved in the evolution, refinement and implementation of the Arty Profile. There was total continuity. Handing over the baton was not symbolic. It was handing over a thought process from one DG Arty to another. As a result, successes were reinforced. More importantly, Artillery learnt from failures. Beneath all the successes, there is a solid bed of failures which taught us how not do things. Very importantly, Artillery was fortunate to have certain key officers who grew up in the system and had a deep understanding of all cases. The background of each case was well known in the Directorate. There was no reason to change course. Every time hurdles propped up, the strong background knowledge helped us to vault over them. Very fortunately, three ex-Chiefs of the Army were always around to guide us with their sage advice when we encountered problems. A key element was that the Regiment of Artillery was looking at seven different kinds of 155 mm Guns as per our terrain and tactical requirement. Initially, it sounded ambitious. People even derided us for being confused and diffused. Many felt that we were attempting too much. Some short-sighted seniors and bureaucrats even asked us to prune down the Profile. Our logic - if one attempts to procure seven systems we would breakthrough with two systems at least. We could maximize on them and drop the others after a review. It is great that four systems are on the anvil of induction. More importantly, when dealing with the contenders for each case we told them that if they did not measure up we would not hesitate to drop them since we had other options. We let all contenders know the overall progress we were making on all cases. It gave us an immense potential to hedge. It also created a healthy competition amongst various programs and case officers. Each contender knew that they had to deliver on time otherwise they would miss the bus. Hedging ensured that costs were also kept within reason. Ultimately no one could hold us to ransom. If India had a viable alternative to the Rafale, many things would have been different including costs. Modern Artillery is technology intensive. The Artillery Directorate was technologically strong. To highlight the issue, weight reductions means understanding materials and structures technologies, increasing range and lethality means understanding metallurgy, explosive and propulsion technologies, increasing accuracy means understanding electronics and GIS technologies. For each Gun, the technologies and approaches are manifold. One had to understand technologies and how implementable they are, also their impact on operations to arrive at realistic outcomes. Technological mumbo jumbo did not fool us. A holistic appraisal of all technologies was taken so that programs could be executed in time. It is often said that the ‘best is the enemy of good’. We lowered sights, accepted the achievable ‘good’technology and kept the wishful ‘best’ out. However, in doing so it was ensured that the essential technologies were harnessed for implementation. A major factor of success was Ownership. At every stage, everyone knew we owned the programs and intended to succeed through hard work and thoroughness. We involved ourselves in every process intimately. We were the go-to and fall back guys in the program. All our officers – from the case officer to the Director-General – knew the nuts and bolts of a case. To a large extent, we were even interchangeable in many forums. We were in a problem-solving mode in all stages – approval stage, trial stage, evaluation stage, cost negotiation stage and contract signing stage. Any problem or issue had to be well analyzed, expertise was gained and then solved to our advantage. We generated confidence and trust in the procurement chain. We held the hands of bureaucrats, researchers, developers, production agencies and vendors. Their problem, if it was professional, was ours too. We assisted them to overcome all hurdles. Our ownership was so strong that, time and procedural loops were shortened. We never hit a wall which we could not climb. No issue was brushed under the carpet. It generated team spirit and ownership in the environment as well. We had reached the stage of autarky. Procurement of 7-8 guns simultaneously involved huge risks. One ‘Bofors Kand’ dogged the nation for thirty years. Even if one of the programs became murky or tainted, a long shadow would have been cast on others and everything could crash. Hence, high levels of integrity, honesty, security and discipline were insisted upon and enforced. When people were made aware of the risks involved, they responded magnificently. Nothing which was not needed to be known outside ever went out of Directorate. We operated on a strict need to know basis. One colleague felt that OFB was unreliable, US government was not trustworthy, the private sector was infantile and DRDO lacked the capability. All programs were high-risk propositions and we were sticking our necks too far. Our reply was “No pain no gain! All players – private and public, Indian and foreign, had stakes and had something to look forward to. It evens out risk. Lastly – sarek hi baarkatsaktahai!”We conveyed to all vendors that the best bribe they could offer was - better services, better spares, better costs and adherence to procedures. We also communicated that any skullduggery would lead to instant blacklisting. The true weapon of the Gunners is the shell. Hence, ammunition, specifically fuses and charge systems were high focus areas. A multi-pronged approach was mounted - limited import to tide over criticalities and building indigenous long-term capability. Conduct of trials for fuses in high altitude was a hurdle. An innovative and dynamic brigade commander dismantled a 1300 mm Gun, took it into high altitude and successfully conducted trials of electronic fuses. It led to two sources of indigenously assembled electronic fuses. Old mechanical fuse manufacturing lines were reopened. DRDO and OFB were indigenizing Bi-Modular Charge Systems independently. We synergized their effort, brought them on a common wicket with a common technology. These efforts paid tremendous results. Just after the Surgical Strikes we took stock and found that we had built up adequate ammunition to handle eventualities. I am sure by the time Doklam happened, things were far better. In my opinion, that was one of the reasons that we could take a stand as we did. That is proof of the pudding. Contrary to the popular impression created by media, India is not that short of Artillery ammunition as it is made out. Going ahead we can only grow stronger. There were many a ‘doubting Thomas’ with small minds. But many good people supported us. One COAS conveyed to us that he trusted us to deliver goods. It gave us a great fillip that we had the backing of our Chief. That made us reach for the sky. Two successive Dy Chiefs gave us solid guidance and encouragement to adopt out of the box solutions to progress cases. We never looked back. Two successive Def Secys helped us revive almost dead cases and supported their completion. The contribution of Mr Manohar Parrikkar, then RM, was immense and critical. Very early on in our respective tenures, he conveyed to me that Artillery was his priority. In my initial presentation, I conveyed what could be realistically achieved. His monitoring and interest thereafter paved the way and cleared many roadblocks. His ideas and encouragement meant a lot. Some of his solutions were fresh and simply excellent. In fact, from that perspective, he was one of the best defence ministers India had in the recent past. It is unfortunate that he is not too well these days. Personally, I hope he keeps good health and wishes him all the best. Success in Artillery Modernization is attributable to the level of support at the highest levels in the MOD and Army. We used the ‘Maruti Model’ wherein from a fully imported car India has moved to an export regime. A similar story is unfolding in Artillery systems. Very soon we should be exporting Guns and ammunition if we play our cards well. All new Artillery systems have a high indigenous content by design. This successful ‘Make in India’ program has not been widely publicized. They say that success has many fathers and failures none. This case of a hugely successful Artillery modernization combined with a robust Make in India content has no fathers. Very funny. Yeh Mera India! Artillery is called the ‘God of War’. It is also said that God is on the side of big guns. I am confident that our ‘God of War’ is making the Indian Army stronger by the day. It will see India through on its day of reckoning. That is a promise of an old Gunner. The author is a former DG Artillery, Indian Army.